Hey so I don't normally read the accomplishments thread very carefully, but if a sensor is acting up and you report it to me I can go take a look at it. I can even meet up with you so you can test it out! I'm gonna be at ACME for a couple of hours this morning (I'll probably get there around 10 or 10:30) and I plan to look at the up arrow. If you want to meet up with me so I can tweak it while you play, is Tuesday evening at all okay for you? I'd aim for tomorrow but they're closed for a private event. Edit: I should probably ask you to specify which up arrow, although it's easy enough for me to look at both sides! P2 Up, although something has changed and I was able to pass the 16 from earlier. Tuesday evening.... err.. I'm working starting at 5.. ^_^"
got zero and a pad almost on Xepher Challenge. Pretty much counting it as my first ten footer AAA because the almost was on a left arrow 8th note in an easy spot really early on. I'll redo it for a legit photo later. Andy, how do you AAA things so well? well when you own a machine you can play songs over and over and over and over. Funny enough I almost never play Xepher Oni but since I've AAA'd the Heavy chart it makes sense that this would happen, the charts are almost identical. Also once you figure out how to stay consistent with timing, AAAing charts just becomes a habit. tonight will be the first time i've played ITG in a month wooo. wasn't expecting to even pass it so I was happy. I have a mega mix now until I can burn an extreme ISO and either change the boot file OR i'm just waiting on a new EEProm to boot it official extreme. Slowly getting towards that Pendulum achievement. I can do 15s on my second set now .-. This is another night, right after work, on 3rd set. Kevin's the name, speed's my game. Accelerate. If I'm correct, Nick has actually reset the timing windows to be as tight as an original ITG arcade machine, but not sure if it's the same as ACME's. Turns out it wasn't that bad a 16. It was like playing M.A.M.A. but just for about 6 minutes and a little less full-on stream. High level 15 or something. If you guys are using a newer type of computer for the upgrade, you need to have *tighter* set windows than stock ITG to compensate for the lack of input delay. yo kevin great job on that Another Planet Pass! I'd say it's a 16 for sure. A little harder than voyager imo but playing Still Grey or Back 2 You and you'll understand. I'm just not kinda getting back into it. 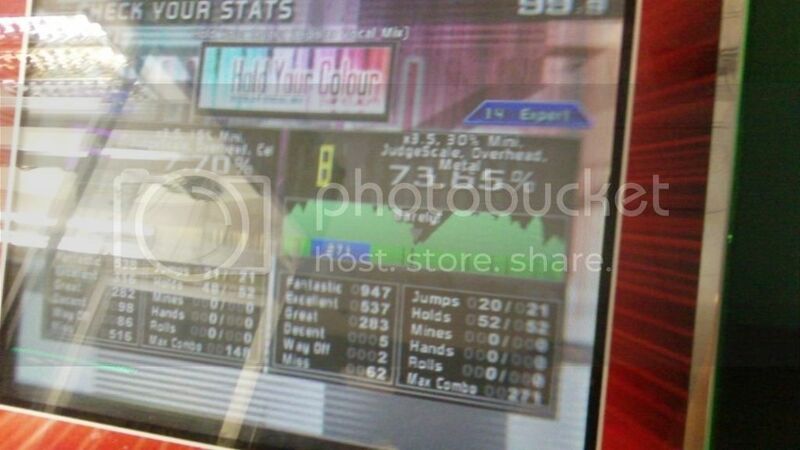 I was playing a LOT of DDR and I recently got Max2 and Extreme running on my cab (working on getting 2013 up and running hopefully thing week) Got most of the Max2 exclusives and I have like 80 AAA's left for SN and Extreme. I went to cali the week of thanksgiving and got to play lots of machines and then I've been sick for the following two weeks so I just started playing some ITG again. Some how managed to pass a 14 cold the other day and got a 90% on BloodSugar so my stamina isn't totally shot. Trying to get back. As I start exercising and playing more I'm going to rotate between DDR and ITG. I'd like to get back to 17's by summer but if 2013 happens I know i'm going to get caught up in AAAing stuff. So stay tuned I guess.